Specialized containers for transportation of bulky and heavy loads. The containers 20 foot weighted, 20 foot opentop, 20 foot fletrek 40 foot weighted 40 foot opentop, 40 foot fletrek we Will pick up the necessary transport container proceeding from your requirements and requirements of carriers. Delivery + further transportation across Ukraine, CIS, World. 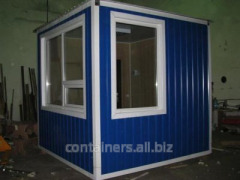 Unbelievable price on The containers 20 foot weighted, 20 foot opentop, 40 foot weighted, 40 foot open the top, 20 foot fletrek, 40 foot fletrek Delivery + further transportation across Ukraine, the CIS, the World in Kiev (Ukraine) company Kontejnery Ukrainy, OOO.